Here's a very, very. very cool video introduction to our Futures-Past science fiction, fantasy, and horror imprint ... created by the brilliant Bill Mills. I met A. E. Van Vogt just as he was experiencing the first onset of Alzheimer's. I had been brimming with so many questions about the deeper psychological currents that run throughout The World of Null-A. A novel which starts when the hero realizes he is not the person he believed himself to be and so sets out on a quest to discover who he is, a quest that reaches a culmination of some profundity for a science fiction novel of the 1940s. 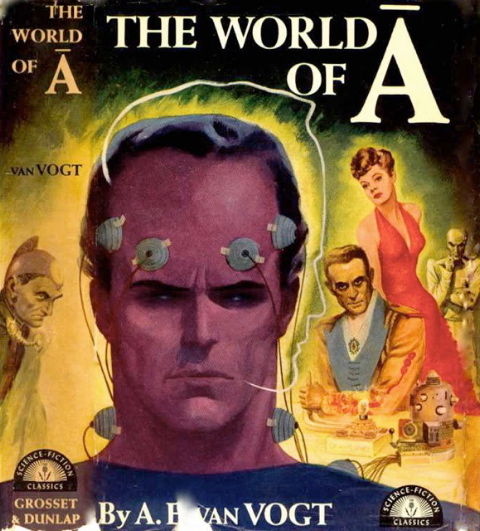 It is no coincidence that the protagonist of this futuristic tale is named Gilbert Gosseyn (go sane). The method by which he does so is soundly based on the science of the time, involving a "cortical-thalamic pause" and the application of non-Aristotelian thinking. Van, alas, could shed no light on the writing of his earlier books or what the intentions behind them were. He had forgotten it all. What I want to share with you here is a little known sidelight on the cover of an early hardcover edition of The World of Null-A. Pulp magazine cover artists are never paid so well that they can afford to hire professional models. To make up for this lack, many artists, including the astounding Virgil Finley of Famous Fantastic Memories fame, copied photographs of movie stars because they were easy to come by free. Hence, if you will study below, you will see Marlon Brando as Van's mental superman, Boris Karloff as the villainous onlooker to his right, Barry Fitzgerald as the impish figure on the left, and a (by me) unidentified female star of the era on the right (though she is very familiar looking). A. E. van Vogt Never tell yourself not to think! 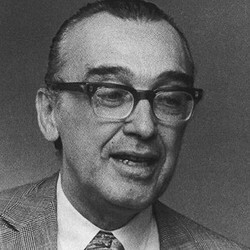 Alfred Elton van Vogt was always known to his friends as "Van." Although affable and easy to approach, he looked a trifle austere and I cannot recall ever seeing him wear anything but a dark suit and what my husband liked to call a "sincere" tie. His voice was a pleasant baritone and he had a mellow laugh that seemed to spring from honest surprise at humanity with all of its foibles. He was also a very handsome man, tall, dark-haired, with a clean-cut profile. In an era when most science fiction was of the "first contact" sort, with cookie-cutter heroes battling rubber-suited aliens, Van wrote about characters with intelligence, characters who had feelings and who understood cause and effect. His first published short story, "Black Destroyer," was a breakthrough that inspired a host of tales with aliens that were more than mere cardboard cutouts for the hero to knock down. I knew one science fiction enthusiast who named her black tomcat Coeurl, the Black Destroyer in person. His landmark novel, "Slan," a story of people who are human and yet different, gave us Jommy Cross and Kier Gray, unforgettable type-characters for a generation of young science fiction readers. In some ways, "Slan" is a coming-of-age novel, and Jommy Cross, who preceded him, is akin to Holden Caulfield of "Catcher in the Rye." Although set in a science fictional universe, "Slan" portrays a young boy who is alone, persecuted, and alienated from the world around him. Kier Gray, initially seen as his nemesis, becomes at the end a protective and kindred soul - very much a father figure. The Weapon Shops series, with its slogan of "The right to buy weapons is the right to be free," has echoes well into the present day, when people are still debating gun ownership laws. Van's weapons, however, could only be used in self-defense. As well as having a strong sense of morality, Robert Hedrock, an immortal Weapon Shops protagonist, learns that his actions have unavoidable consequences. Having married into the royal family in order to strengthen the genetic line, he finds that genes which insure the continuation of the line have side effects beyond his ability to change. The characters in van Vogt's fiction are not the loveable sort that a reader can cozy up to. They tend to be super-human in their outlook and morality and they are always supremely logical. Van was a meticulous and methodical writer. The two books that he cited as major influences in his writing career were "Narrative Technique" by Thomas H. Uzzell (1934) and "The Only Two Ways to Write a Story," by John Gallishaw (1930). He was extremely diligent in doing the exercises printing in those books as he taught himself how to write, and throughout his career he followed the precepts promoted by Uzzell and Gallishaw. (Both books are long out of print, but I found used copies via the Internet.) Following their guidelines, Van wrote books and stories that are tight and cohesive, without excess verbiage. He wrote in 500 to 800 word blocks, each of which is structured like a short story with its own complication and denouement, and he admitted to several of us that he felt extremely uncomfortable if his plot did not follow that structure. Although it seems somewhat mechanical, this approach results in logical writing with very strong plots. Van had been involved with Dianetics, which was L. Ron Hubbard's non-religious precursor to Scientology, and when I told him that I was troubled by recurrent and unpleasant thoughts, to the point that I was telling myself, "Don't think!" he was horrified. No, he told me. Never tell yourself not to think! The thing to do was to pick a date in the future and every time I got caught in an unpleasant mental turmoil, put it off by promising to think about it on that future date. I did as he suggested and was delighted to find that it worked quite well. When I told him so, he was very pleased and pointed out that it was an exercise from his Dianetics training. Van's first wife, E. Mayne Hull, was devoted to his interests. She was brilliant, lively, and a pleasure to be around. They had a nice home in the Hollywood Hills and I remember that their sunny kitchen held her collection of African violets. In the sitting room were a dark wood screen, heavily ornamented, and some deeply carved and amazingly uncomfortable Chinese chairs, inherited from a relative. When Mayne died of cancer in 1975, after thirty-six years of marriage, Van was distraught. Not a religious man, he none the less cherished a hope that there was some kind of survival after death, and he had her tombstone inscribed with the pet names he had known her by, as well as her full legal name. He said it was so that if she did survive in spirit and was by chance lost and wandering, she could find a resting place and an anchor there. Several years after Mayne's death, Van married Lydia Bereginsky, a charming and very lovely court reporter. Lydia was acutely aware of Van's political position, as stated in his Null-A and Weapon Shops novels, and when a group of us made plans for a two-week tour of the USSR she tearfully dissuaded him from going along, being certain that he would be arrested upon arrival and never allowed to return to the United States. She may have been right; in any case Van decided to forgo the trip. Unfortunately the last years of his life were marred by Alzheimer's Disease. The last time I saw him was in the early 1990s, at one of Forry Ackerman's parties. Lovingly tended by Lydia, it was obvious that he did not know where he was or why, and had no idea who any of us were. It was a sad end for a brilliant intellect. 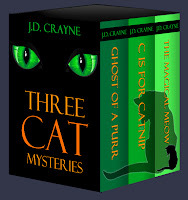 J. D. Crayne is the author of the Captain Spycer send-ups of rip-roaring space opera for Futures-Past Editions, and of cozy mysteries, including the Mark Stoddard series for Deerstalker Editions. An omnibus book edition of her feline detective novels featuring "Lucky Pierre," Three Cat Mysteries, is available free via the Amazon Lending Library for all Amazon Prime Members. And the price has been slashed to $3.99, which is a lot of cat mystery for the price.